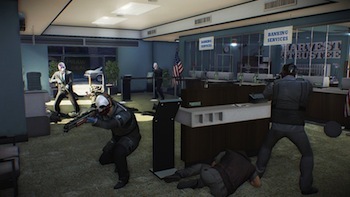 The next Payday may shift its attention to playing "cops versus robbers." Overkill Software director David Goldfarb says that the next entry in the Payday series, presumably Payday 3, could take a different approach to heist simulation. Specifically, its a possible that the new game might be designed with versus mode in mind, pitting robbers against player-controlled police. "The one thing, without going into too much detail, is we made a lot of decisions on this game that were ambitious and risky, and one of the reasons that we were able to get it out on time and make it generally a good game is that we didn't entertain a lot of stuff that was outside of our core focus, and the core focus is not versus," Goldfarb said. "The core focus is co-op. So when we revisit whatever we're going to do for the next one maybe that'll change." Goldfarb, who worked on Battlefield 3 at DICE before joining Overkill, suggests that adding multiplayer (or single-player) to a game with a different primary focus can hinder development on all kinds of gameplay. The notion suggests that, if Payday 3 were to include competitive multiplayer, it would lead to changes in the co-op experience as well. "It was good that we kept our focus and enabled us to finish this game," explained Goldfarb. "Now I'm not going say we would never consider it, but that's what we did on this one." Of course, that isn't to say that Goldfarb has confirmed that the new Payday will have a versus mode. Technically he hasn't confirmed the game at all. That said, parent developer Starbreeze revealed that Payday 2 has sold more than 1.58 million copies as of last week, so more another game seems likely, if not inevitable.